Don't worry, you won't be buried under the white stuff during the Everest Poker Avalanche event. However, you could find yourself knee deep in cash courtesy of this $1 million prize pool promotion. This new tournament from Everest Poker is run over nine months. Three satellite rounds will take place to allow players of all ability and bank roll size to compete on a level playing field in the Avalanche main event. Round one will have buy-ins aimed towards the lower bank roll. $3+$0.30 and $11+$1 satellites will be on offer for players who would like to qualify for as little outlay as possible. Round two has satellites with a buy-in of $56+$5, to appeal to the medium sized bank roll. High rollers might be interested in the Round three satellite. This once a month tournament has a buy-in of $530+$30 and provides direct qualification to the Avalanche tournament. Naturally, this being Everest Poker, an online poker room which provides value for money for every sized pocket, everybody is welcome to have a shot at the Avalanche... even poker whales! This means, if you wish, you can buy-in directly to the Avalanche final. This won't be cheap, of course, you'll need $5,000+$300 to ensure your seat. 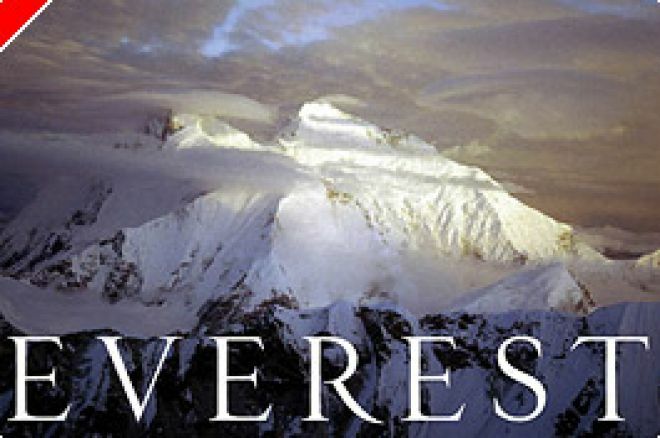 The top ten finalists from Avalanche will be whisked away to a secret location to play out one of the biggest poker events in Everest's history. $1,000,000 is in the prize pool, so the final is sure to be a tense and exciting affair. The live final will take place on September 17th, 2007. Ed note: Bury your bank roll in an Avalanche of cash when you download Everest Poker - we'll throw in an extra $50 for free when you deposit too!